Chinese President Xi Jinping’s special envoy Zhang Chunxian on Friday attended here the 50th independence anniversary of Equatorial Guinea. Zhang, a vice chairman of the Standing Committee of the National People’s Congress, was invited by Equatorial Guinea’s President Teodoro Obiang Nguema Mbasogo, with whom Zhang met on Thursday. Zhang conveyed to Obiang warm greetings and best wishes from Xi, and passed him a congratulatory letter from the Chinese president. “China and Equatorial Guinea have enjoyed a friendship for many years marked by fruitful bilateral cooperation in various fields,” said the special envoy. “China is ready to implement with Equatorial Guinea the important consensus of the two heads of state and the fruits of the Beijing Summit of the Forum on China-Africa Cooperation (FOCAC), to further develop their comprehensive cooperative partnership and to contribute to building an even stronger China-Africa community of a shared future,” he continued. 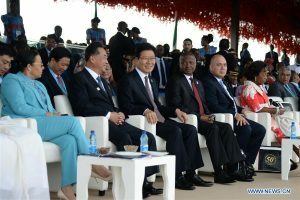 “The eight major initiatives announced by the Chinese president at the FOCAC Beijing Summit will further support the sustainable development of Africa. Equatorial Guinea is ready to deepen cooperation with China under the FOCAC to better develop their bilateral relations,” he said. 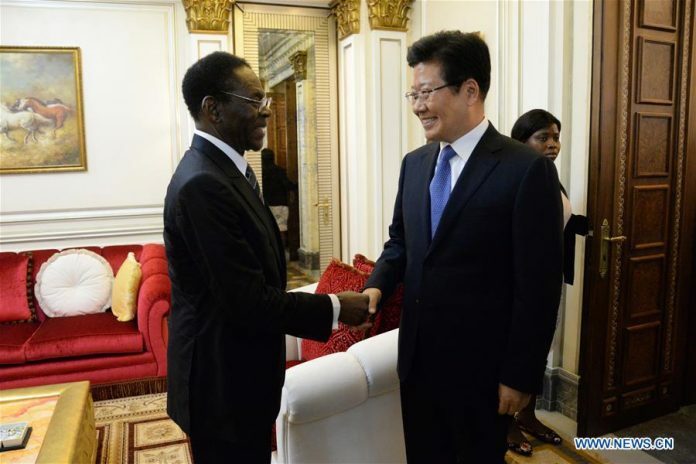 During his stay in Malabo, Zhang also met President of the Senate of Equatorial Guinea Maria Teresa Efua Asangono.